What is the value of strategic planning? We firmly believe that the best way to create value for an organization is through having a long term perspective on operations and that a road map, i.e. a strategic plan, is a critical component to succeed. We see structure as a prerequisite to make the strategic planning process a relevant exercise, not just done for the sake of doing it. It starts with a vision, i.e. what do you want to achieve? Then follows the development of a strategy, i.e. what concrete actions and choices maximize the likelihood of achieving your vision? The strategy is then translated into a strategic plan, which lays out the actions and initiatives planned in a formalized manner, including timelines, key milestones and an expected financial impact. Please note, however, that we see the action items and milestones of the specific initiatives (what and how) to be of greater importance than the actual financial outcome (how much). In short, strategy should drive the numbers, numbers should not drive the strategy (a neat financial forecast in a spreadsheet without any substance behind it is basically worthless). Finally, the most important step is the execution phase, where it all comes together and one should deliver. We see the value of strategic planning being made at several levels. Organizations, small and big, private and listed, often tend to be focused more on short term operational issues than long term strategic objectives. Taking some time to step out of the daily routine will facilitate taking a longer term perspective, while also potentially positively influence operations in the shorter term. An important benefit of strategic planning is to create focus on the strategic direction of the organization. In a properly executed strategic planning process, one asks relevant, sometimes tough and difficult, questions meant to generate a critical thought process. Subsequent thinking and discussions should be performed with an open mindset, not restricted to existing solutions, including stepping outside of one’s comfort zone, acknowledging that the future may be very different to the current situation. With a strategic plan developed a road map is in place for driving the organization forward with execution discipline being key. Keeping in mind that the only thing certain about the future is that it is uncertain and full of unknowns, both known and unknown, everything will definitely not go as planned, neither should one slavishly follow the plan come hell or high water. What the strategic plan does provide is direction and guidance with regards to what the organization wants to become and how to get there. An organization’s vision and long term objective may not necessarily change due to unforeseen events, but a detour may be required, in which case it is important not to lose track of your destination and ensure you continue to move forward in the right direction. 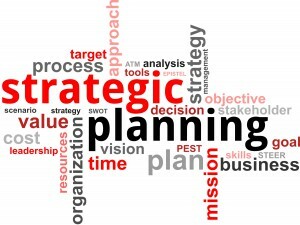 Finally, does a defined strategic plan stop you from being opportunistic? Not at all. To the contrary, it may actually serve as a support tool to improve decision making as whenever an opportunity arises, asking questions such as “does this fit with my strategic objectives?” and “can this decrease my execution risk” can actually improve the quality of decisions, e.g. through ensuring that opportunities accepted are coherent and aligned. Whereas companies often tend to be operationally and short term focused, value creation is a long term process. Having a road map, i.e. a strategic plan with clear and well defined action items, improves the likelihood of successful strategy execution. Opportunistically chasing short term opportunities may drive growth and profitability for a certain period, but in the long term we believe that a structured process is a necessary, though not sufficient, condition for consistently creating value. A strategic plan serves as a reference point for an organization’s direction and this, focus on strategic priorities and supporting execution discipline represent some of the elements generating the value of strategic planning.